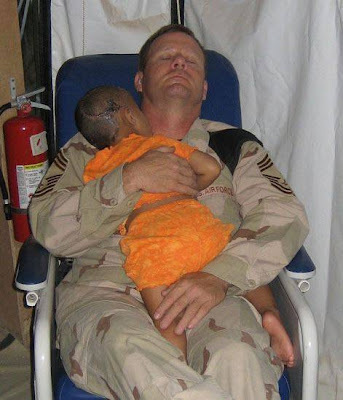 John Gebhardt's wife, Mindy, said that this little girl's entire family was executed.. The insurgents intended to execute the little girl also, and shot her in the head...but they failed to kill her. She was cared for in John's hospital and is healing up, but continues to cry and moan. The nurses said John is the only one who seems to calm her down, so John has spent the last four nights holding her while they both slept in that chair. The girl is coming along with her healing. This, my friends, is worth sharing. Go for it!! You'll never see things like this in the news. Please keep this going. Nothing will happen if you don't, but the American public needs to see pictures like this and needs to realize that what we're doing over there is making a difference. Even if it is just one little girl at a time. This is so touching. It brought tears to my eyes. what a sad story but good to know the little girl has someone to comfort her. Oh my goodness this is sooooooooo touching!! I found it touching too ladies. And so very sad. A side of war we don't get to see often and I'm thinking the soldier needed the little girl as much as she needed him.